Went to Stockholm’s Magic Bar on Friday night – one of only a handful of restaurants in Europe which has live magic every night of the week. The close-up magic was exceptional and the stage show richly entertaining. We also got a guided tour by the owner during which we were given the story behind various piles of memorabilia dotted around the establishment. One such memorabilis was the extravagantly illuminated letter paper of Chung Ling Soo, a renowned Chinese magician from the turn of the nineteenth century. He travelled the UK and stunned audiences with his bullet-catching trick (you can already guess how he died…). Since he didn’t speak or understand any English, his manager conducted all wage negotiations on his behalf, so that when Soo turned up to perform, the Machiavellian theatre owners had no chance to renege on their original offer. One fateful night, Soo caught the bullet as usual, but this time in his right lung instead of between his teeth. On being shot, Soo, who was said to have performed before the Emperor of China, started speaking English. His greatest trick, it seems, was convincing the world that he was Chinese, when he was in fact an American fraudster named William Robinson. 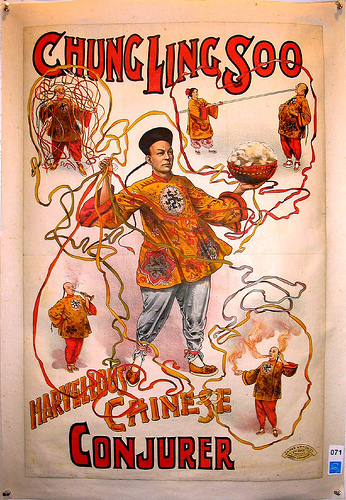 Leaving behind a failed magic career in the US, Robinson reinvented himself in the UK by stealing the act of genuine Chinese conjurer, Chung Ling Foo. Acting as a latter-day David Chopperfield, he built such a reputation for himself that when the real-deal Chung Ling Foo arrived in Britain several years later, he faced public accusations of being his own fake. Coincidently, Soo’s manager also disappeared the very same night Soo didn’t bite the bullet, leading people to believe that Soo and his manager were in fact the same person. The plot of a film? Maybe. Evidence that before the Internet you could get away with pretty much anything? Very definitely.